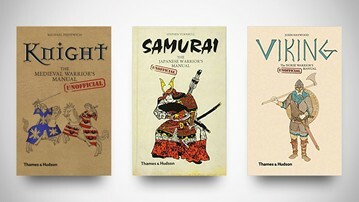 Publisher Thames & Hudson's [Unofficial] Manual series covers all the greatest warriors in history, from samurais to to medieval knights, vikings to gladiators. Each of the part-entertainment, part-for-real books has a different author, one who is an expert on the periods and warriors the how-tos discuss. I'm talking PhDs, university professors, and professional historians, impressive cats. Though I doubt any of them could suit up and go all-out Miyamoto Musashi or Ragnar Lothbrok on the street. Maybe you'll have better luck becoming an [Unofficial] Warrior reading their manuals. In Samurai: The Japanese Warrior's [Unofficial] Manual Japanese military history writer and historian Stephen Turnbull consolidates and concentrates the research on medieval Japan into 200 pages of training to help you make your bushi officer debut. To become a member of this fighting class, you'll need to maintain the honor of the samurai, and learn his skills both in and out of battle. The samurai manual covers mastery of: the Way of the Warrior; determining who to kill, and what to do with the heads when they're severed; storming a castle; conducting a tea ceremony; and preparing for entry into the White Jade Pavilion after your death. Knight: The Medieval Warrior's [Unofficial] Manual author Michael Prestwich is Emeritus Professor of History at the University of Durham. Here he shares his expertise to assist in your Sunday Funday of learning to wield a sword, join a Crusade, make a fortune, and bask in glory. With honor and chivalry, of course. Author and Roman history PhD Philip Matyszak picks up where Russell Crowe left off in his teachings. Gladiator: The Roman Fighter's [Unofficial] Manual uncovers how to become the most brutal and ruthless fighter in the empire. Subtopics include: how to join the gladiator ranks; who will try to kill you, and with what; which arena of the empire best matches your personality; when and how often you'll go into mortal combat; and what happens before, during, and after a duel. Another Philip Matyszak how-to, Legionary: The Roman Soldier's [Unofficial] Manual takes you back to the year 100 AD, when everyone thought Rome was un-fallible. You as legionary are part of a machine that keeps it that way through the brute force of pushing back barbarian hordes, and pushing forward the Roman Empire's property lines. In the Legionary manual Matyszak covers the ins and outs of army life, from drill to diet, and choosing the best wardrobe to dodging enemy spears.